At Handmade City, a holiday art walk I attended last December, I met a metalwork artist – Steve Todd of Iowa City – who told me he has had a lifelong fascination with medieval chain mail. Among the wares he was peddling that frigid, windswept December afternoon, a collection of pins he had on display caught my eye. 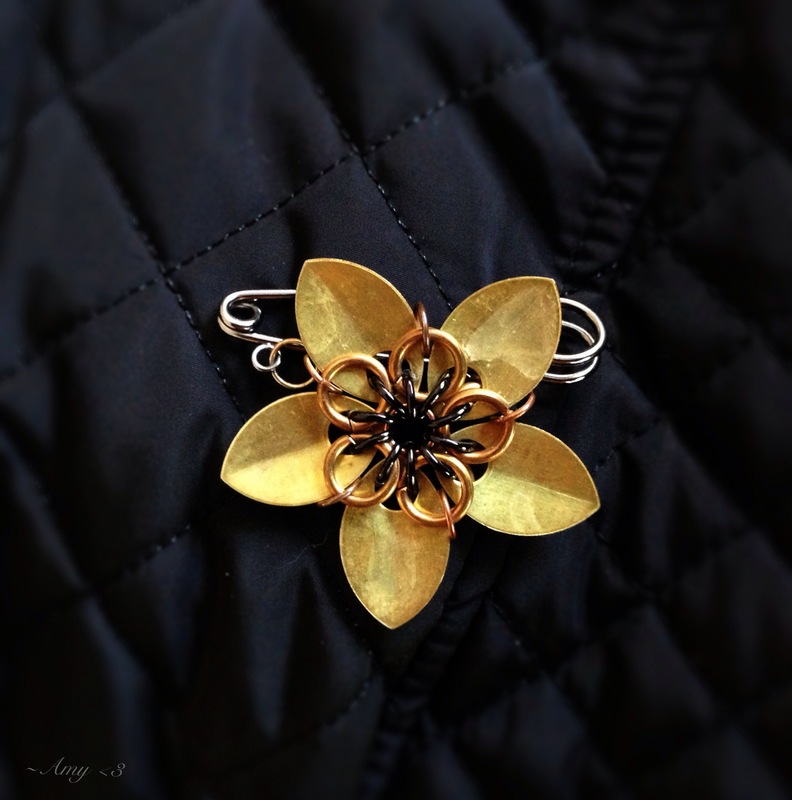 Each pin featured a metal flower whose center was decorated with a small circlet of chain mail. As a proponent of the Shop Small movement, I love to support the creative efforts of artists whenever I can, so I happily purchased several of Steve’s chain mail flower pins. (I admired his pins so much, in fact, that I bought one for myself.) I brought them home, wrapped them up, added to each a tag that said, “Put your armor on!” and slipped them into our daughters’ Christmas stockings. I knew the pins would make a big hit, and they did. My “put your armor on” concept dates back to high school. Although I loved school, was studious, and earned good grades, I’d occasionally grow anxious before tests. I discovered that test days never seemed quite as stressful if I was clothed in a favorite outfit – my own girlish armor. On days I dreaded an upcoming test, I’d dress to the nines. Somehow, wearing my best as I sat down to flex my brain and demonstrate my command of the subject matter at hand gave my knock-kneed confidence a boost – just enough to power me through. Lately, I smile to myself, thinking of our girls walking around their winter cities, sporting chain mail flowers on their lapels as an outward expression of an inward frame of mind. When someone happens to comment on the one I wear on my own coat, I enjoy pointing out Steve Todd’s workmanship and clever design. Then I add, with a grin, “I’ve got my armor on today!” Saying these words, knowing what they imply, realizing how firmly I subscribe to their meaning gives my confidence a boost – just enough to power me through. And off I go into my day, wearing my armor. I happened to capture this photo at sunset a few days ago while waiting at a traffic light. Overhead, a deep, cobalt sky faded to pale blue in the west, where a thin layer of almandine clouds lined the horizon like strands of carded wool unfurling. 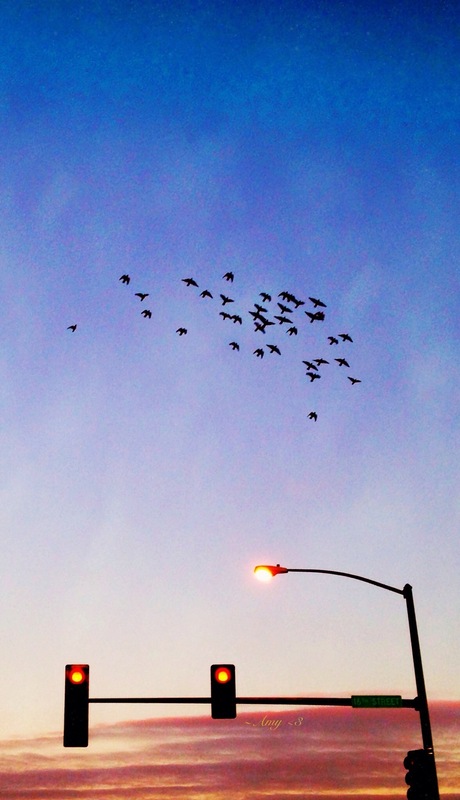 Just as my car rolled to a stop, a flight of birds appeared before me. Black against the light of the late-day sun, they were a murmuration, an undulation of ethereal loveliness. I grabbed my camera, aimed, and pressed the shutter. Click. The light changed to green, and I drove away. Looking back at this photo now, I realize it represents more to me than just a fleeting moment of wild beauty. It also represents the way I look at my life. This red stoplight can be likened to the negatives, the things that – if I let them – can bring me to a screeching halt. And they are many. Anxiousness. Sorrow. Illness. Insecurity. Indecision. Worry. Stress. Fear. So much can happen, so much has happened, that is beyond my control. While this is a fact both obvious and irrefutable, I know there is much in my life that can be controlled. And a good deal of it boils down to a simple thing. Perspective. As I have weathered the vicissitudes of the life I’ve been given, I have come to realize that choosing my perspective is everything, and that each day when I wake, the choice is mine. I can wallow in grief, walk the endless figure eight of worry, and exaggerate my fears until these negatives stop me cold and become roadblocks to my happiness. Or, I can look up and beyond to the greater vista. Like the birds that take flight across the limitlessness of the sky, my soul is free, my spirit is indomitable, and my possibilities are endless. No red stoplights, no roadblocks for me. My choice, every day, is to keep looking up.